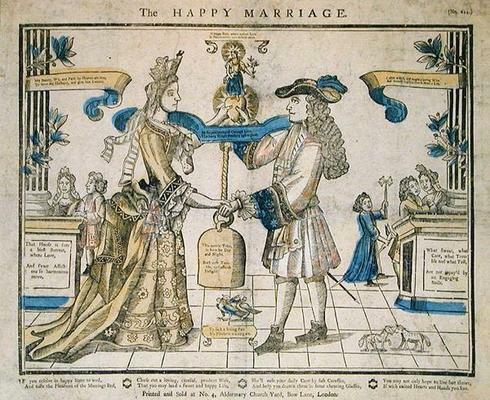 Marriage customs of 17th Century England might or might not seem crazy today...although several of them could certainly be described as unusual. As the groom spoke the line, “With all my worldly goods I thee endow,” he placed a coin or a purse onto the cleric's prayer book. On one occasion in 1680, the purse contained 200 guineas—a small fortune! On a more mercenary level, this was equally symbolic of the fact that so many marriages—whatever the couple’s social class—were arranged by parents or guardians or even landlords or masters. On leaving the house for the church, or the church itself, money was often distributed to people gathered in the street, and paid to the musicians (frequently they were trumpeters) heralding the newlyweds or playing at the wedding feast. If the bride was extremely young, she and her groom might live apart for a period of time. John Evelyn, aged 26, left his 12-year old spouse and spent four years travelling before taking up the role of husband. 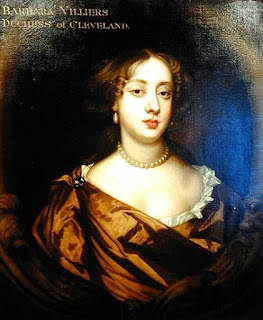 The Princess Royal, daughter of Charles I, seen here at the time of her wedding in 1641, remained in England for a year after marriage. After joining her husband in Holland their marriage was not consummated for a further three years. Very little has changed since the 1600s. After the ceremony people gathered for a wedding feast, featuring wine and spirits, elegantly decorated and arranged tables of food, cakes, music, and dancing. The earlier ‘bride pie’ gave way to cake in the 17th century. Rather, cakes. The bride cake was larger and more elaborately iced, with egg white and sugar, and decorated. 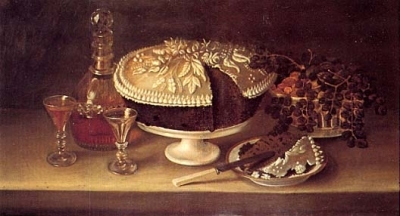 The groom cake was a plainer fruitcake, which was diced up and presented to guests in a small box, as a lucky souvenir. Marriages weren’t supposed to occur during Advent and Christmas, though records reveal that this was not uniformly followed in the 17th century. Therefore late November, before the First Sunday in Advent, was a popular time for a wedding. After St Hilary’s Day, 13th January, marriages resumed. There was a similar prohibition in Lent, the most solemn of liturgical seasons. Perhaps this fact, in addition to the popular lore connected with it, made Valentine’s Day the choice of some couples. Marriages were again permitted from the Sunday after Easter. April was therefore a very popular month—partly because Lent had ended, but also because May marriages were regarded as unlucky. Then, as now, June was also a month for weddings. Also considered unlucky—and highly inconvenient—by country folk, was the period between haymaking and corn harvest, July through early September. The first Stuart monarch, James I, was mad for weddings. He played matchmaker to some of his courtiers, helping his male favourites to marry into money, and he hosted their marriage celebrations in his palaces—often with a masque as well as a banquet. On one occasion, in 1617, at the conclusion of festivities he commanded that the couple should extend their wedding night till noontime, adding that he would join them in bed in the afternoon to hear the details of the consummation. The bride was fourteen—how embarrassing it must have been for her—and the bridegroom twenty-six. During the Commonwealth marriage was no longer a church sacrament but a civil contract. To be legal, it had to be conducted by a justice of the peace. The banns could even be cried in the marketplace rather than in the local parish. Sundays, previously an acceptable day for a marriage, were disallowed—a prohibition still in force in the Anglican tradition. After 1656, weddings could again take place in church. Following the Restoration, during the riotous reign of Charles II, marriage was deemed a necessity for procreation and accessing a title or fortune. The ceremonies might be lavish and costly, but fashionable people sought sexual pleasure outside the bonds of marriage. 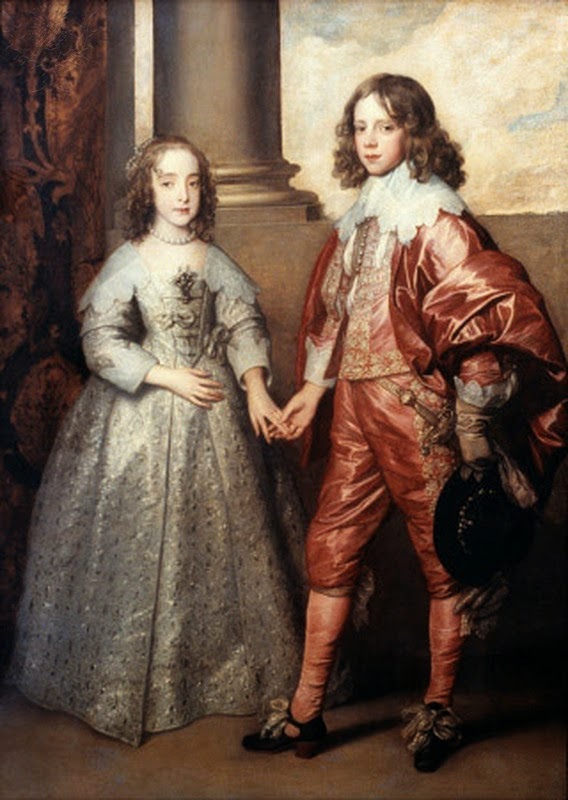 Royal marriages, when the couple lived in different lands, could take place by proxy in the bride’s location, with a second ceremony immediately upon her arrival in her new husband’s country, as with James, Duke of York (later James II) and his second wife, Mary of Modena. 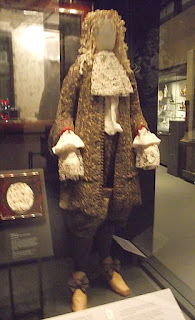 At their court wedding in November, 1673, her bridegroom wore this lavish costume, on display at the Victoria and Albert Museum in London. The great painters of the day produced marriage portraits, either immediately before or immediately after the wedding. Normally the couple were painted individually, although double portraits can indicate a recently-wedded couple. 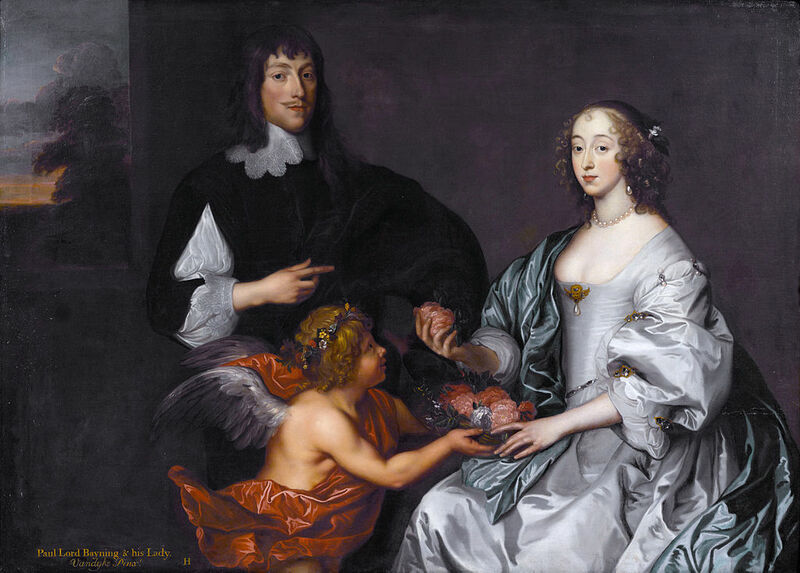 The first double portrait below shows the 2nd Viscount Bayning and his wife in a gown very much like one a bride would have worn at her wedding, and the presence of Cupid presenting a floral garland hints at matrimony as well. The second, by Peter Lely, nearly a copy of the first, depicts the Baynings' daughter and heiress, Anne, with her husband Aubrey, 20th Earl of Oxford de Vere (father of Lady Diana de Vere, and a prominent character in A Pledge of Better Times). They married in in 1647 when Anne was ten years old and Aubrey twice her age. 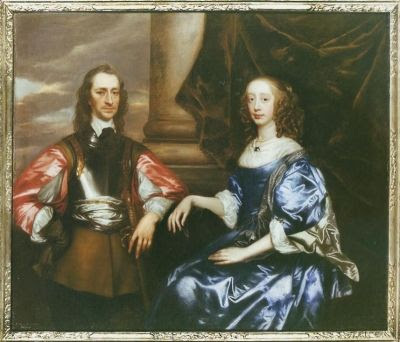 Their portrait, attributed to Peter Lely, is dated 1650, and could be indicative of their beginning to live together as husband and wife. 27 April 1693. My daughter Susanna was married to William Draper, Esp. in the chapel of Ely House by Dr Tenison, Bishop of Lincoln. I gave her in portion £4000, her jointure is £500 per ann…Much of this week spent in ceremonies, receiving visits and entertaining relations, and a greate part of the next in returning visites. Gloves, white or yellow, were also presented. At the wedding of John Manners to Lady Anne Pierrepoint in 1658, a dozen pairs of yellow gloves were ordered to distribute to the guests. On the day, the bride wore her best gown, or a new one, depending on her status. The colour preferred by the wealthy was silver, which prior to the Victorian white wedding gown, symbolised purity. Her bride-maids’ attire would be similar to hers. The groom, his family, and his bride-men would also display their standing in society through their garments. There are written descriptions of weddings for merchants and tradesmen, indicating that these are occasions of community coming together, as with the upper classes. These weddings were as much alliances of family interests as much—if not more—than simply the union of the two individuals at the altar. There is a dearth of records of weddings for the unlettered masses. Most could be described as a ‘penny-bridal,’ in which a tavern-keeper might provide the couple with a gathering place—and a lodging for the night—in exchange for the money to be received by their guests for ale, wine, and food. The festivities were merry—contests, foot-races to and from the parish church—and generally included a bawdy bedding ritual, with jesting and serenading on the other side of the bedchamber door or beneath the windows. 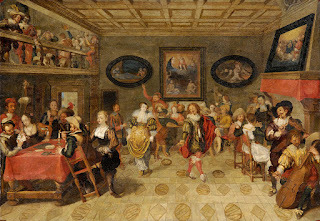 Dutch and Flemish painters created vivid scenes of villager weddings and feasts during this era, and the Marriage at Cana was a popular subject for religious art, sometimes with the characters in contemporary clothing. English wedding scenes are a rarity prior the 18th century. If you enjoy reading about customs of the past in England, this book is for you! Be sure to follow the other Blog Hop links for fascinating information from all the other participants! Genealogy enthusiast and historical author Christy K Robinson’s family history searches have taken her into the great cathedrals and obscure country churches in which her own ancestors—and those of the millions of other people sharing their genes—and other notables were either interred or commemorated. 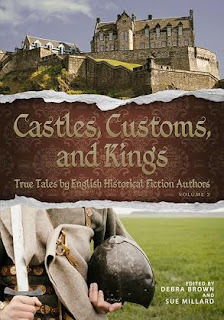 Her latest book is a treasure trove of information about the burial styles of her numerous subjects, primarily royalty and aristocracy of Britain and Europe during the Dark Ages and Medieval times. Not only does she analyse specific monuments and their symbolic elements, she describes the effects of civil wars and religious disputes on the physical contents of churches and examines discrepancies between burial records and popular legend. A brief section on Crusaders and pilgrims covers important personages who did not survive their journeys to the Holy Land. 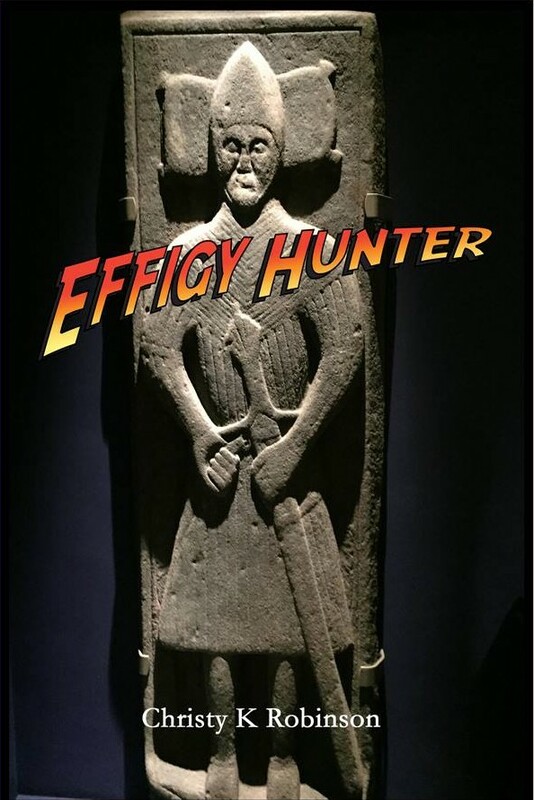 A valuable reference for historians and genealogists, Effigy Hunter is equally a travelogue and travel memoir. Through anecdote, illustrations, and photographs, Robinson shares her extensive travels through England and other countries. Region-by-region sections contain charts of essential information on the location and dates of effigies and memorials, making this a useful field guide for those wishing to visit sites in person. 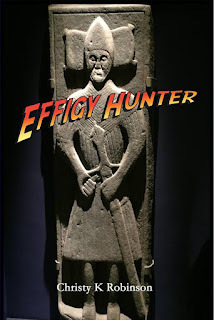 As entertaining as it is informative, Effigy Hunter is very highly recommended for genealogists, historians, novelists, and travellers.